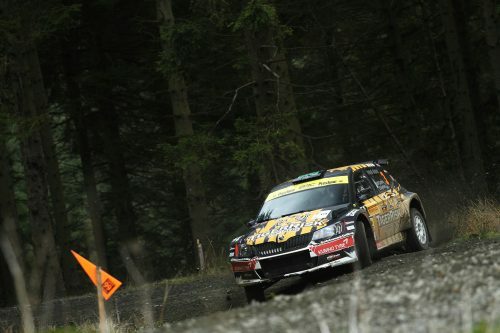 The entertaining Marty McCormack launched his 2019 British Rally Championship plans this evening (4 February) and will return to the top flight of Britain’s premier rallying series in his Skoda Fabia R5 – but he has made a few changes in the off-season. McCormack will start his fourth consecutive season in the BRC in a Czech machine and will be looking to challenge at the very front after a disappointing campaign by his very high standards in 2018. For Marty, the spiced-up calendar in 2019 was massive a draw. The man from Draperstown revels on the Belgian Tarmac, and Ypres rally fans took him into their hearts during his spirited drive to eighth overall in an S2000 car back in 2015. Since then, luck hasn’t gone the way of the Irishman with two subsequent retirements. Third time lucky in 2019? Speaking of the Ulster, Marty always knocks on the door of BRC podiums on home soil. What does the 33-year-old think of the latest Irish event? Marty will be tackling the new season with a new co-driver, as Barney Mitchell dons the Tiger Risk overalls for the year ahead. The last question every driver gets asked – what are the hopes for the new season? Title, wins, podiums or points? For Marty, it’s a different take on proceedings.